He may be the former head of the Republic of India, but he is a teacher at heart. The teacher in former President Pranab Mukherjee was writ large at the first leg of ‘Pranab Sir ki Pathshala’ an initiative to stay connected with students at his residence in Delhi on Wednesday. 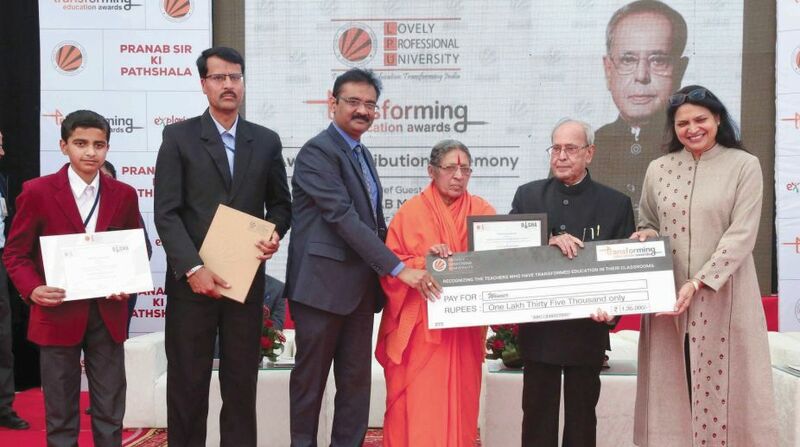 during the event, Pranab Mukherjee also conferred LPU’s ‘Transforming Education Awards’ on the country’s best schools and teachers. 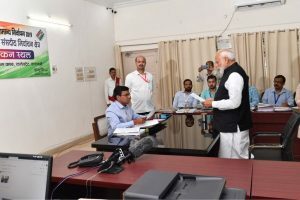 Cash awards of Rs 1 crore in the form of teaching grants to schools, coaching centres; and appreciation awards to teachers, mentors and students were distributed by Mukherjee. Lovely Professional University (LPU) under its corporate social responsibility had launched the awards on Teachers Day on 5 September 2017, to acknowledge the efforts of teachers and schools. Addressing the gathering, mainly of students and teachers, Mukherjee underlined the need for basic research in education. He said the lack of interest and facilities for research are the reasons not a single researcher from any Indian educational institutes could bag a Nobel prize. “Students from India as fellows of foreign universities did bag the honour, which proves the point that we have the calibre and lag behind as facilities are not up to the mark,” Mukherjee said. The former President also interacted with students and took questions on a wide range of topics, such as reservation, equality, scientific temper and vision for India. During the event, 89 schools and 29 coaching centres received teaching grants, while awards were given to 89 schoolteachers and students. Also, 29 coaching institutes’ mentors and students were awarded on the occasion. During his interaction with students, Mukherjee exhorted all segments of the society to put in efforts to make India inclusive, innovative and responsive to the aspirations of the common people. The awardees were selected on the basis of voting in which students of different schools and coaching institutes across India participated. The voting was done with videos shot by students of their teachers and the response was overwhelming with 3,495 nominations, 6-lakh votes and, 30 lakh+ views. Lovely Group chairman Ramesh Mittal, LPU chancellor Ashok Mittal and LPU pro-chancellor Rashmi Mittal were also present.